SC:C atpakaļ uz rasējamā dēļa? Metal Gear Solid 4? Big deal, right? Look at the Xbox 360 line-up for 2008; it contains titles like Ninja Gaiden 2, Banjo-Kazooie: Nuts and Bolts, Gears of War 2, and Splinter Cell Conviction. Oh, wait, one of those titles won't be hitting this year after all. 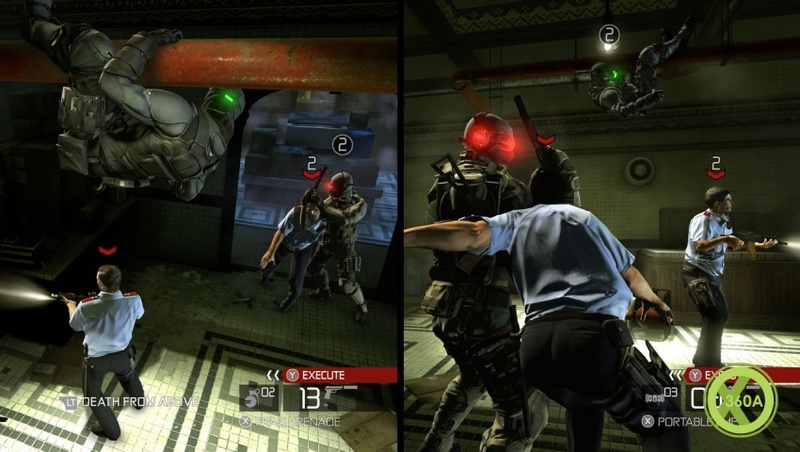 It appears that 360 owners won't be enjoying an espionage experience this year with Splinter Cell Conviction because the title is being taken "back to the drawing board" by Ubisoft Montreal. Well, this is according to a report in the latest issue of Xbox World 360 magazine anyways. As of now, Ubisoft hasn't officially released word on the state of the latest installment of the Splinter Cell title; however, the magazine is saying that it heard the title will now be ready for holiday season 2009- or as late as Spring 2010. 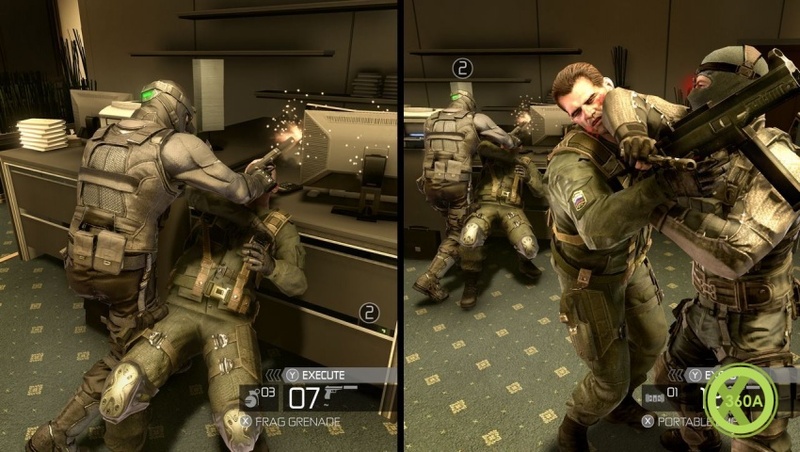 Splinter Cell Conviction has been development for a number of years, and was supposed to be the Metal Gear killer for Microsoft. According to XBW 360, it's probable that Conviction has simply become outdated by more recent Ubisoft titles- namely Assassin's Creed. Luckily, Ubisoft's UbiDays event is due to take place in Paris next week, so we can hope for some concrete details surrounding this missing gem. Until then, get jealous of PS3 owners and Metal Gear Solid 4, because you're in for a long wait. note: SC DA bija super gan no single player , gan ari no MP puses. Nu tad iesaku jums arī Splinter Cell: Chaos Theory. Arī ļoti labs. Bet pirmās 2 daļas ir galīgi garām. Vopšem, neko saprast nevar ar to Semu Fišeru. It's been a while since our last message but we're happy to say that development of Tom Clancy's Splinter Cell Conviction is continuing well and the game is shaping up nicely. The team here is very dedicated and focused to making sure that Conviction turns into an amazing experience of Splinter Cell. There are lots of rumours flying around right now about Conviction's development status and we can tell you that the gameplay has evolved, similar to what happens in every game's development process, and you won't be disappointed. We take your feedback from these forums very seriously and, although we can't respond to each and every thing people say, we do take these posts into consideration when making the game. Unfortunately we're not able to make Ubidays this year but in the forthcoming months we'll be back in touch to begin showing you this new installment of the Splinter Cell series. • Archer & Kestrel are the new Co-Op characters. • Cover compared to Gears "..slip from one hiding spot to the next, like a more svetle Marcus Fenix." • Pressing A when you're caught in a coke hold will elbow your Captor in the gut, giving your partner a brief chance to take a headshot. • If you're wounded, you can either play dead or use your pistol until your partner heals you or you bleed out. es arī laikam varētu pievienoties šim bariņam par co-op. jo ir doma pirkt, ja vien būs līdzekļi. Vēl nedaudz jaunumi par jaunāko Splinter Cell. Kā izrādās coop būs iespējams ne tikai online, bet arī offline split screen režīmā. Tāpēc ir jāspēlē ar draugiem, par kuriem zini, ka viņi spēli nav spēlējuši. iesaku novilkt demo, man patika! nav vairs kā vecie splinteri, grafika un vadība jūtami uzlabojusies. Laikam uzreiz nepirkšu, bet, kad kritīsies cena, tad noteikti. uz realistic gāju kādas 10-15H Storijs superīgs ! Meklēju kādu, kas vēlas uzspēlēt coop.